Organizing is the key to working faster in Pro Tools and like you would expect from such a powerful software, it provides with numerous and very useful organizational tools. In this article, we will be looking at memory locations in Pro Tools. Creating and managing memory locations can increase your Pro Tools workflow tremendously if used properly. In a nutshell, memory locations are markers that store information about a specific timeline location or other session parameters such as zoom, open floating windows or track view. Storing such markers allows the user to quickly navigate through the session in time or in what is displayed on the screen. The more complex the session the more useful Memory Locations become. The most common use of memory locations is in mapping out the song form on the timeline. By doing this, the user can quickly navigate and jump between sections of the song. In mixing for example it is very useful to define selections using memory locations; defining looping selections becomes a two-click job using timeline markers stored as memory locations. 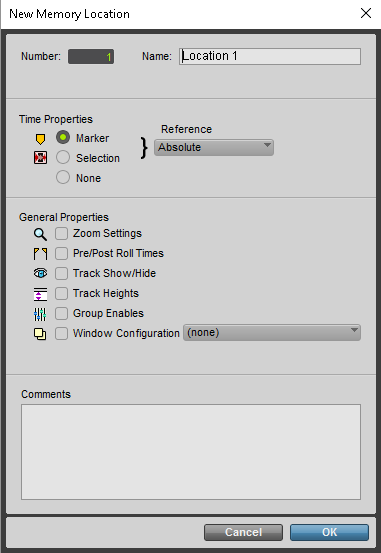 To display the marker timeline in the Edit Window you have to click the Edit Window Views and check Markers on the list. Showing the Markers in the timeline view. You can define a timeline marker by pressing Enter (in payback or not, it does not matter) or by pressing the small + sign in the marker timeline. Upon defining a merker a floating window will appear letting you configure how it is stored in the memory locations. We will go through this floating window in detail but first let us see what we can do with these memory locations if we do not change any parameter of this window, other than the name. I will name this first one Intro and I will make a few more to map out the structure of a song. If I click on any of these my cursor will automatically jump there. If I want to select the verse, for example, I would click on the Verse marker and then while holding down Shift click on Chorus 1. 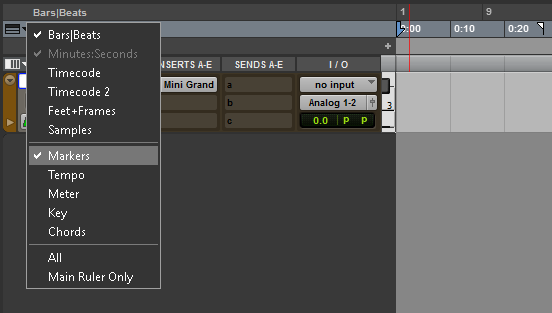 Another way of making selections and jumping from section to section is by using the memory locations window. you can bring this window up by pressing CMD+5/ CTRL+5 or by going over to the Window tab and then clicking on Memory Locations. Similarly to the technique described above you can jump to a section by pressing on the name of the desired location. If you want to make a selection you can click on the desire start marker and then Shift+click on the marker that you want to be the end of the selection. Beyond the basic timeline storing of locations Memory Locations can do so much more for you. A lot more actually. Let’s take another look at the Memory Location configuration window. The window is divided into 4 panels. The first panel is self explanatory: you can choose the number of the memory location and the name. The second panel allows you to select whether you want the memory location to store a marker timeline location (a specific point in the timeline of your session), a selection or no time reference whatsoever. If you want to store a selection simply select an interval of time in the timeline and proceed to defining a memory location and obviously, select the selection time property . “Why would I choose no time reference?” you may ask. To answer this, let us take a look at the third panel which contains the general properties that you can configure for a memory location. Again, it is pretty self explanatory: all the properties you select will be stored in the memory location exactly as they were when you initiated the configuration of the memory location. For example if I want to store a certain track view, with specific track height and certain zoom settings I would select Zoom Settings, Track Show/Hide and Track Heights from the properties listed. The fourth panel allows the user to write a comment about the memory location such as “fix 200 Hz problem on Hammond organ in this selection”. Storing a memory location with track height, track view and zoom settings. If I were to go back to my normal view of the session and then click on the new Kick Mix memory location then all the settings I selected would change so that I will be able to see everything just as above. There are so many scenarios in which this is useful that listing all of them is pointless. Whether you are mixing, arranging, editing or syncing using memory locations to store session settings in order to be able to quickly navigate the session is a very, very powerful tool. I use memory locations in all my Pro Tools projects to keep everything organized and that helps me work a lot faster. The more memory locations you define, the more control you will have over navigating your session. Naming and organizing the memory locations themselves is important too as a messy list of unclear names will definitely not help you work faster.